Imagine walking into a store empty-handed and walks out with a working new mobile connection. That is going to be a reality soon if you have an Aadhaar card. Even the physical presence of the Aadhaar card is not required, just the UID number is enough. Telecom ministry was asked to work with Unique Identification Authority of India (UIDAI) by PM Narendra Modi to make this a reality as soon as possible. Now there are a high number of cases of people use someone else’s identity papers to get SIM card from an unauthorized person. This is called identity theft. By using Aadhaar card to verify identity by checking the persons bio-metric linked with the provided UID will prevent it. The officials said the telecom companies were willing to implement E-KYC solution and install bio-metric readers with their vendors to provide online authentication of a person having an Aadhaar number. “Once the Aadhaar based E-KYC solution is implemented, it will find whether the person seeking mobile connection has presented his correct identity. The confirmation can be used by the service provider for instant activation of the mobile connection,” a gov official said. The was discussed at the September 6 meeting with PM Modi and he asked the Telecom Minister Ravi Shankar Prasad to work on it. 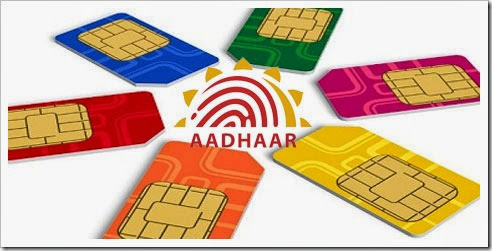 The government sources said that the UIDAI and the telecom ministry have worked on the suggestion and the instruction in this regard is expected soon.